Is it your birthday or anniversary? Did your significant other get a promotion or graduate from school? Did you just hit a green light? Basically, there’s no celebration, milestone or holiday that couldn’t be made better by a massage, says Carol Nestor, half of the husband-and-wife team that owns and operates Nesbit. 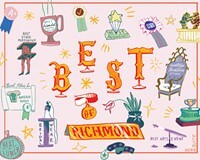 It’s where Richmond goes when it wants to turn stress relief into something romantic.